April’s special issue of Science magazine focuses on the Grand Challenges in education. This is Bruce Alberts’ last month as editor of Science Magazine and it was his choice to make a special issue devoted to science education. This report on the expeditionary learning linking science and engineering reflects the vision of NGSS. Teachers Gus Goodwin and Peter Hill (and their teammates) at King Middle School create a meaningful context for science and engineering. I am inspired by the student learning capture in this video report. Take a few minutes to watch it. I think you will agree, you can see the practices, crosscutting concepts, and core disciplinary ideas in this expedition. The Standards are now live. Achieve released the Next Generation Science Standards today and Maine is proud to have been among the 26 Lead States that participated in the development of these standards. The timing for this release is PERFECT. Throughout the spring and summer Maine educators can begin to acquaint themselves with NGSS and revisit the Framework for K-12 Science Education. That process should continue throughout next year. Implementing this vision is a multi-year collaborative effort. No district will be able to comprehensively and effectively transition to the NGSS over a summer. I am already looking forward to Fall 2013. In October both the Maine Science Teachers Association and the Maine Curriculum Leaders will focus their conferences on the NGSS. You can access the NGSS document at http://www.nextgenscience.org/. Thank you to our friends at the University of Maine RiSE (Research in STEM Education) Center for this post to the SciTech Framework Blog. As readers of this blog already know, A Framework for K-12 Science Education describes an approach to science teaching that differs from traditional instruction. 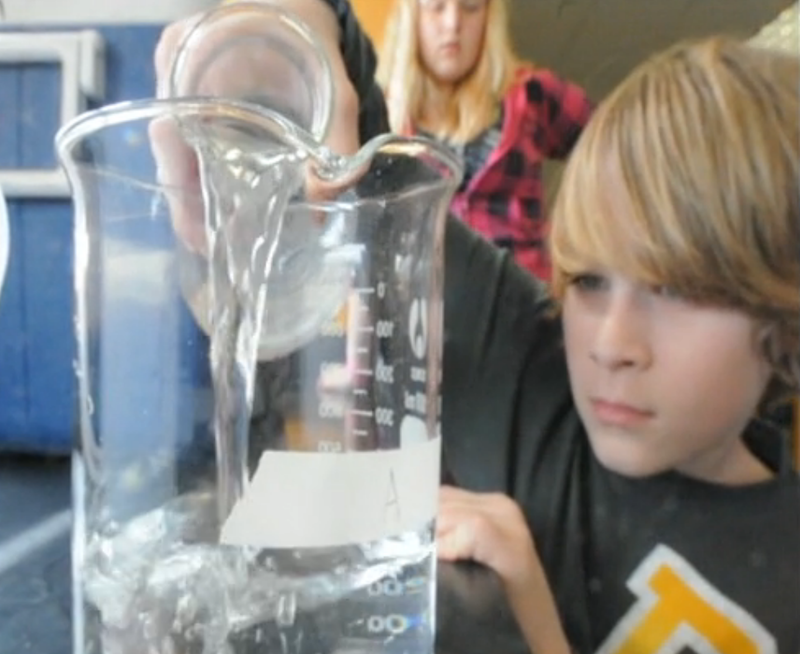 Traditional approaches focus primarily on students’ learning about science content. With a traditional approach students might also learn about scientific practices, but the tendency in many classrooms has been to treat scientific practices as a topic to learn in addition to the content. The vision of the Framework promotes instruction where “students, over multiple years of school, actively engage in science and engineering practices and apply crosscutting concepts to deepen their understanding of each field’s disciplinary core ideas (p. 2).” The Framework requires that students demonstrate understanding of core ideas through engagement in practices and crosscutting concepts. Teacher and students at Troy Middle School measuring. – From Bangor Daily News files. The Maine Physical Sciences Partnership (MainePSP) brings together rural Maine school districts, the University of Maine, the Maine Center for Research in STEM Education, the Maine Department of Education, and several education- focused nonprofit organizations to build a sustainable infrastructure that strengthens rural science education. 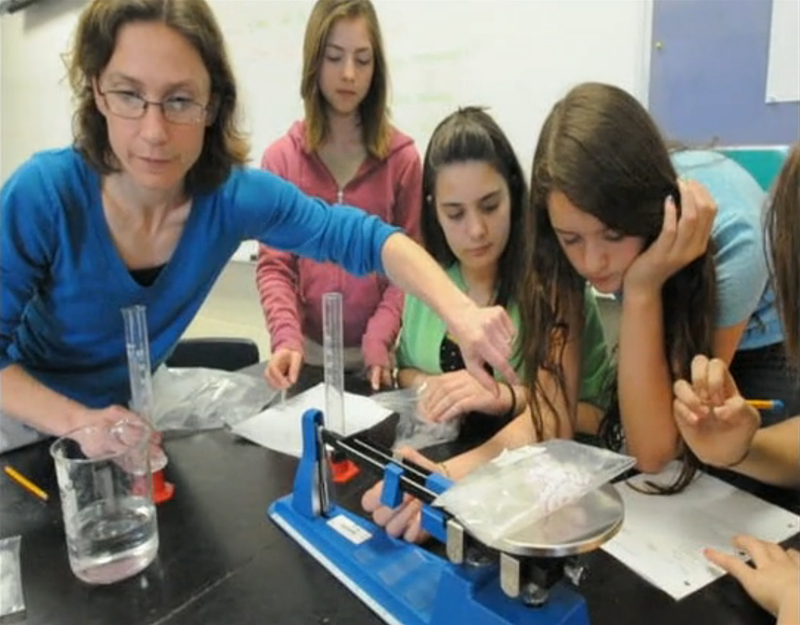 Supported by a $12 million grant from the National Science Foundation, the key initiatives of the MainePSP include science teacher recruitment, retention and preparation, teaching and learning of physical science in the critical grade range of 6th-9th, and research informing future rural education initiatives. Some of the work now underway addresses aspects of the K-12 Framework. Troy Howard student pouring water. – From Bangor Daily News files. One of the MainePSP project’s core innovations is the selection and collective implementation of research-based science curricular materials. The middle school partnership selected two different sets of materials: Issues and Earth Science from SEPUP (Science Education for Public Understanding Project) for grade 6 and PBIS (Project-Based Inquiry Science) for force and motion, energy and chemistry, typically in grade 7 or 8. Grade 9 teachers selected EarthCOMM (Earth System Science in the Community) as the set of foundational materials. Each set of materials contains elements that are aligned with aspects of the Framework. The common instructional resources in the MainePSP provide a basis for shared experiences and rich conversations among teachers and University of Maine STEM and education faculty as they discover together how to strengthen science teaching and learning. The most important conversations reflect the Framework’s increased priority on the learning of scientific practices and on the integration of those practices with science content learning. With the collaborating teachers, the MainePSP faculty is studying and working through some of the issues that allteachers will face as they implement Next Generation Science Standards, built upon the ideas expressed in the Framework. • Definite – students should learn something once correctly, and then and move on. They should have a visible gain in proficiency or knowledge over a short time period. • Rapid – Students should have rapidly expanding experience and a rapid progress through the curriculum. • Extensive – should have exposure to a large volume of content. On the surface, these three conceptions of progress are attractive. Of course we all would like definite, rapid, and extensive progress that results in a lot of learning! Framework-aligned learning, particularly the learning of science practices and the critical thinking that the practices require, develops slowly over many repetitions; its progress is sometimes difficult to perceive, and it is, of course, not voluminous. The MainePSP’s work with teachers across many different schools also provides evidence that it is not just the teachers who will need to develop new ways to think about student progress as science instruction aligns with the Framework. The teachers work in contexts that are shaped by expectations from building administrators, parents, school districts, state standards, and state assessments. The MainePSP sees the adoption and enactment of Framework-style instruction as a community-driven endeavor that will take place over a period of years. The MainePSP, with its engagement from curriculum coordinators and whole school districts, provides a unique opportunity to encounter and work through the challenges of moving toward Framework-aligned instruction across the whole system of supports for science education in Maine school districts. It is our hope that lessons learned from this Partnership will inform the adoption and enactment of instruction congruent with the new Framework and the forthcoming Next Generation Science Standards. ORONO – Education Commissioner Stephen Bowen announced today that Maine has been selected as one of the lead partners in a state-led, national, collaborative effort to improve science learning for all students through the development of more effective and rigorous science standards. He made the announcement at the University of Maine before approximately 80 K-12 and university science educators, curriculum coordinators, principals, professional development providers and others gathered for a conference reviewing the recently-released “Framework” for the coming science standards. Education Commissioner Stephen Bowen discusses Maine’s lead role in developing the Next Generation Science Standards. Behind him are, from left, Dana Humphrey, Dean of the College of Engineering at the University of Maine, and Everett Deschenes, a manager at Old Town Fuel and Fiber. As a lead state, Maine will have a key role in developing the Next Generation Science Standards, which will define the science content and concepts that students will need to learn in order to be successful in the workforce, economy, and society of the coming decades. The state will also benefit from significant technical assistance and support in developing an implementation plan for sharing the standards with educators statewide. The standards are expected to be completed by the end of 2012. Bowen’s announcement came a week before Achieve, the national group managing the development of the Next Generation Science Standards for the states, is to name all of the lead states. Maine is already engaged in significant work to bolster science technology engineering and mathematics (STEM) learning opportunities for students. The Department has worked with partner organizations throughout the state to build support for STEM education. Key among these efforts have been the continuation of the Governor’s Academy for Science and Mathematics Leadership and workshops focused on helping the community understand best practices in publications such as the National Academies of Science’s “Ready, Set, Science!” Resources like these will provide the backbone for the Next Generation Science Standards. from K-12 and higher education, business and industry, and the community, to promote STEM education, and to give Maine students and Maine’s economy a leg up by encouraging more students to enter STEM fields. Everett Deschenes, a manager at Old Town Fuel and Fiber, spoke to that in his comments at the event. Laurette Darling, president of the Maine Science Teachers Association, a 2010 Presidential Awardee for Science and an elementary teacher at Albert S. Hall School in Waterville, spoke to the need for new standards and assessments, saying that science facts are not enough. Dana Humphrey, Dean of the College of Engineering at the University of Maine, spoke to the changing workforce needs in Maine. He cited examples of Maine companies that have had to turn away contracts because they couldn’t find enough engineers to hire. Laurette Darling, president of the Maine Science Teachers Association, a 2010 Presidential Awardee for Science and an elementary teacher at Albert S. Hall School in Waterville, speaks about Maine’s lead role in the development of the Next Generation Science Standards. Bowen said as a small state, Maine will benefit greatly from the opportunities provided by developing and then sharing standards among many states. Bowen recognized the Department’s science specialist, Anita Bernhardt, for her leadership role in promoting STEM education and for writing Maine’s successful application to be a lead state in the standards development process. Bernhardt said the announcement made the conference’s work of reviewing the Framework all the more important. The second step is the development of grade-by-grade science standards based on the framework. As a Lead State Partner, Maine will help guide the standards-writing process, gather and deliver feedback from state-level committees and come together to address common issues and challenges. The Lead State Partners also agree to commit staff time to the initiative and, upon completion, give serious consideration to adopting the Next Generation Science Standards. In order to be considered, states had to submit a letter with the signature of the Chief State School Officer and the chair of the State Board of Education. In addition to those already mentioned, Commissioner Bowen was joined for the announcement by: Jeanne Crocker, assistant executive director of the Maine Principals’ Association; Chris Howell, president of the Maine Curriculum Leaders and principal of Windham High School in RSU 14; Sarah Kirn, vital signs director at the Gulf of Maine Research Institute; Joyce Tugel, K-12 science specialist with the Maine Mathematics and Science Alliance; and Michael Wittman, of the Research in STEM Education Center at the University of Maine. Michael Cohen, president of Achieve, was not at the event but offered his kudos to Maine. David Connerty-Marin | Maine Department of Education | 207-624-6880 Some facts about STEM education in Maine and the U.S.
1Center for Workforce Research and Information, Maine Department of Labor. (2008). Science, technology, engineering and mathematics (STEM) employment in Maine: A labor market and workforce assessment. 2Davulis, L. (2008). Science, technology, engineering and mathematics (STEM) employment in Maine: A labor market and workforces assessment. Augusta, Maine: Center for Workforce Research and Information: Maine Department of Labor. 5Richardson, N., Berns, B. & Marco, L (2010). Briefing Paper on STEM Education in Maine. Education Development Center; and interviews with the presidents of the University of Maine at Augusta and the Community College of Southern Maine. August 2010. 6Maine Department of Education. (2008). Revision to the Maine state plan for Carl. D. Perkins career and technical education for Year II and III. 7“PISA 2006: Science Competencies for Tomorrow’s World, OECD briefing note for the United States;” Organisation for Economic Co-operation and Development; September 2007. 8“A Report on the Findings of and Recommendations for the Delivery of Remedial College Courses” (Feb. 2008) Presented to the Joint Standing Committee on Education and Culture Affairs of the Maine Legislature, from http://www.maine.gov/education/diploma/remedialreport.pdf.